Magic challenges us with a variety of problems. Solving some requires a deep understanding of the format and mastery of the game. Sorry. I can’t help you with those problems, but I can share techniques that can prevent anyone from stumbling over the simple mistakes that afflict all Magic players, no matter how experienced. In Pro Tour Khans of Tarkir, Masashi Oiso thought he had a game-winning line. What he really had was a game-rule violation. He’d forgotten he’d played a Forest with Courser of Kruphix earlier that turn and couldn’t drop another land—Nykthos, Shrine to Nyx. Problem: Did I Play a Land? If even a professional Planeswalker can lose track of land drops, we shouldn’t feel as bashful about our own uncertainty. Any techniques we use to avoid similar issues aren’t signs of mental weakness, but of dedication to the game. I’ve developed a method to know if I’ve played a land at a glance. All it takes is looking at the problem from a different angle. By playing my land upside down, it will always be clear whether I’ve made a land drop. The newly explored Swamp in the picture might look strange, but remember that it’s right side up to someone: my opponent. During my next untap step, I flip my land right side up. It takes practice, but soon, putting lands into play upside down becomes muscle memory. Righting them during the untap step comes even more naturally. I’ve been making my opponents scratch their heads with this method for two years now, but better them than me. The upside-down-land technique helps even more when battling with man lands. I might plan on attacking with both my copies of Inkmoth Nexus, but, no, that’s impossible. One of them clearly would have summing sickness. Now, if only I could tap the right lands in the right order. Nothing brings on that full-body blush faster than leaving the incorrect lands untapped to cast the rest of my spells in a turn. Well, this is embarrassing. I didn’t leave myself any green-mana-producing lands untapped to cast my Sultai Charm. The nagas will throw me into the crocodile pits for sure unless I can improve my scheming skills. I need to plan out my turn ahead of time—that’s clear—but I can increase my chances of not displeasing Sidisi by arranging my lands by color and complexity (mono or multi). I arrange my basic lands by type, with nonbasics behind them. This technique encourages me to use the basics closest to me first. Tapping from the bottom up will leave as many multi-lands untapped as possible and—at the least—threaten a greater variety of tricks. At last I can cast my Sultai Charm. Wait, did I play a land this turn? Oh, that’s as clear as an upside-down sky. I played an Island. Making a land-related mistake can often lead to losing a close game a few turns later, but some blunders can bring instant death. Hall of Famer Kenji Tsumura is famous for saving his opponents from breaking their Slaughter Pacts and dying. 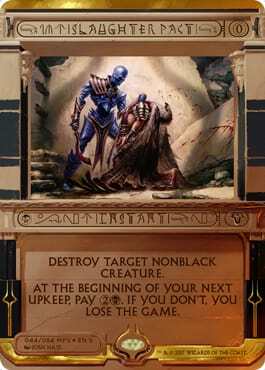 Kenji is a better person than I. I believe remembering upkeep triggers is just one way the game of Magic tests players, and I have no problem allowing my opponents to wreck themselves. Kenji, though, would go as far as to place a die on an enemy’s library. When he’s not around, we have to extend the same courtesy to ourselves. Here, I had four upkeep triggers, so I placed a die indicating the number on top of my library. Not all decks test skill as rigorously as this highly competitive Fungus deck, but the practice proved most useful during Modern Masters Draft, which often presented multiple upkeep effects to remember. But not all triggered effects are considerate enough to arrive during the upkeep. 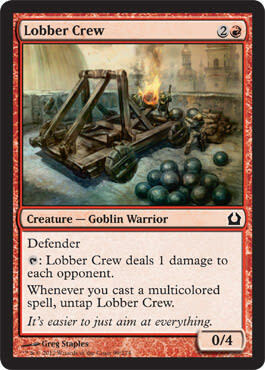 I still shudder thinking of all those times I missed triggers on Lobber Crew or Young Pyromancer. Is there a technique to help remember triggers that occur outside the upkeep? Practicing with Young Pyromancer would help build up the habit of putting the effect on the stack. 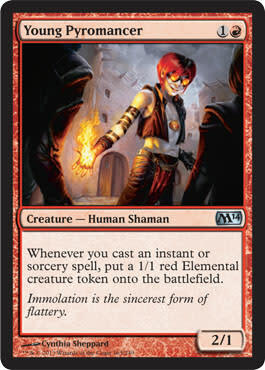 In Modern Constructed, someone playing a Delver deck will probably remember the Young Pyromancer trigger, though the game may be lost if it’s forgotten. In Limited, when I’m not playing the same cards consistently, I find it an ordeal to remember every trigger. The solution here isn’t as elegant, but I don’t care about that if it wins me more games. By placing the die close to my lands, I’m likely to see it as I’m tapping them for mana. I’ll then remember that three abilities will trigger if I play a Lightning Bolt. Note that placing the die on top of my lands would be wrong. That would indicate the land had gained some manner of counter (such as a wayward fate counter from an Oblivion Stone). Judges have accepted my ancillary dice as long as I’m clear what they’re representing. In this scenario, before placing the Lightning Bolt in the graveyard, I would sling some Elemental tokens into play. I might also choose to set a die next to (not on) the Monastery Swiftspear. This would tell me how many times it had received +1/+1 throughout the turn. Since I cast two spells, the Monastery Swiftspear has +2/+2. The die below her indicates that much. I will say, though, that this last die is not a technique I would use. I would prefer to keep the stat increase in mind rather than representing it in play. The trigger is not considered missed until the Monk deals or receives damage. At that point, I can calculate the Monastery Swiftspear’s stats and potentially surprise an opponent who may have forgotten to think of the trigger. Notice also that I have true Elemental tokens, rather than dice, to indicate creatures. I make a point of collecting the necessary tokens for the format I’m playing because I avoid play mistakes when the battlefield is accurately represented. Once in a Pro Tour Qualifier, my opponent slammed down a twenty-sided die after playing Army of the Damned. What was I to do? He had thirteen blockers. I had no flying attackers and couldn’t wade through his decaying horde before he mobbed me for my brains on the following turn. Since Army of the Damned was a mythic rare, I’d forgotten that it places the Zombies into play tapped. If I’d taken the time to lay down an actual token, I would’ve seen that my opponent had no blockers. My Charmbreaker Devils could’ve pranced past his Zombies before they’d fully burst out of the graveyard soil. That’s all for Foolproof Magic this week. What solutions have you innovated to improve your technical play?